See below for more information on some of these topics. The core research in my group involves numerical modeling and data analysis. This is a high performance computing cluster at Compute Canada on which we run our simulations. Students often attend workshops, conferences and summer schools in beautiful, remote locations. This photo was taking at an advanced climate dynamics (ACDC) course in Northern Norway. Understanding Planet Earth gives an introductory overview of topics in Earth and Planetary Sciences for non-specialists. ​One might think that if an ice sheet melts, sea level will rise evenly everywhere, as if the oceans were filling up like a bathtub. In reality, gravitational, Earth deformational and rotational effects following the retreat and advance of ice sheets and mountain glaciers lead to markedly non-uniform patterns of sea-level change. These patterns are often referred to as "sea-level fingerprints" because they are unique to the geometry and timescale of the changes in grounded ice distribution. As an example, the figure on the right shows predictions of the sea-level change immediately following the rapid collapse of the West Antarctic Ice Sheet (left) and marine sectors of the East Antarctic Ice Sheet (right). The plots are normalized by the global average value of sea-level rise, so that they can be scaled up or down for any amount of ice sheet retreat. If you melted enough ice from the West Antarctic to raise sea level by 1 meters assuming that the melt water were spread evenly over the oceans, the US East Coast would actually see 1.35 meters of sea-level rise. Similarly, if you melted enough ice for 5 meters of global average sea-level rise, the US East Coast would see 6.5 meters of sea-level rise (top left plot). In general, the patterns are characterized by a greater-than-average sea level rise far away from the location of ice loss and a large sea-level fall in the vicinity of a retreating ice sheet (the opposite applies for an advancing ice sheet). The bottom plots show polar projections of the same fields in the top plots, zooming in on the region of ice loss. Sea-level modeling can give insight into a wide variety of problems in climate and solid Earth science, including (but not limited to): understanding the response of the planet to ice-age and modern climate changes; predicting the contributions from ice sheet retreat to future sea-level rise; and processing and interpreting measurements of sea-level change, glacial isostatic adjustment and solid deformation. meltwater pulse 1A, Geophys. Res. Lett., 42, doi:10.1002/2015GL063960. During Interglacial Periods. Quat. Sci. Rev. 87: 60–69. fingerprints. Geophys. J. Int. 187, 729-742. Antarctic Ice Sheet. Geophysical Journal International. 180, 623-634. Marine ice sheets like the West Antarctic ice sheet rest on bedrock that lies below the sea surface elevation and interact with the surrounding ocean. The ice loss across the grounding line of a marine ice sheet depends strongly on the depth of water there, such that if the grounding line retreats a little bit into deeper water, ice loss across the grounding line will increase leading to further, runaway retreat (see top frames of videos A and B below, showing a simplified, 1-D ice sheet-shelf model retreating down reversed beds with different reversed slopes). Past models of marine ice sheets have considered the impact of global average sea-level rise following ice-sheet retreat, but as we saw above, sea-level actually falls at the edge of a retreating ice sheet. I have been working with David Pollard as well as Jerry Mitrovica, David Holland, Peter Huybers and Peter Clark to show that these gravitationally self-consistent sea-level changes have a stabilizing influence on marine ice sheets, acting to slow down and in some cases halt grounding line migration. The bottom frames below show simulations in which a sea-level coupling has been incorporated into the ice sheet model, demonstrating the slowdown (A) and halting (B) of the grounding line as compared to the upper frames in which no sea-level changes have been incorporated into the ice-sheet model. (A) Simulation on a steeper reversed bedslope of -0.7 m/km in which the sea-level fall at the grounding line acts to compensate for some of the deepening of the bed, slowing down the ice sheet retreat. (B) Simulation on a shallower reversed bedslope of -0.3 m/km in which the sea-level fall at the grounding line is large enough to fully compensate for the deepening of the bed and stop the ice-sheet retreat. In recent work, we coupled a more realistic, 3-D ice sheet-shelf model to a global sea-level model that incorporates viscoelastic deformation of the solid Earth and applied the coupled model to simulate the evolution of the Antarctic Ice Sheet over the last deglaciation. These results demonstrated the stabilizing influence of the sea-level coupling in a more realistic setting, confirming the conclusions of our earlier work with simplified ice-sheet models. We can use the coupled ice sheet - sea level model as a tool to take an integrated view of the evolution of ice sheets, sea level and the solid Earth. Antarctica during the last deglacial retreat. J. Climate, 31, 4041-4054. doi: 10.1175/JCLI-D-17-0352.1. Earth-sea level model. J. Geophys. Res. - Earth Surface. https://doi.org/10.1029/2018JF004745. ​ Communications 6, 8798, doi:10.1038/ncomms9798. 40 ky. Earth Planet. Sci. Lett. 384, 88-99. Gomez, N., Pollard, D., Mitrovica, J.X., Huybers, P. and Clark, P.U.. (2012) Evolution of a Coupled Marine Ice Sheet - Sea Level Model. J.
Geophys. Res. 117, 9 pp. Geoscience. 3, 850-853. DOI: 10.1038/ngeo1012. The location of future shorelines in Arctic Canada will impact the livelihood of native communities as well as their claim to land and resources. In the flat terrain of the Hudson Bay region (see the photo below, taken near Fort Albany, Ontario), future shoreline migration can be expected to occur due to both glacial isostatic adjustment associated with the last Ice Age and sea-level changes associated with ongoing melting of the polar ice sheets and mountain glaciers in response to future climate warming. The publications below describe work I was involved in to model future shoreline migration in the region, explore its impact on native coastal communities, and educate young native Canadians about these issues. Environmental Education & Communication, 10, 201-210.
of the James Bay Region. Arctic. 64, 24 pages. As a member of the Harvard Graduate Consortium on Energy and the Environment, I engaged in courses, seminars and research on the issues, consequences and strategies related to the future of energy and the environment. I am particularly interested in taking a broad, interdisciplinary perspective on topics related to climate change and sea-level rise, but I have also done research in other areas. 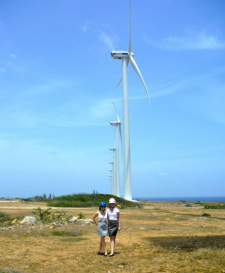 For example, I worked with Meredith Langstaff, another graduate student in the Consortium, to investigate the increase of renewable energy penetration in Aruba. In particular, we looked into ways to incentivize electricity load management technologies such as electric vehicles and electric thermal storage to accommodate intermittency issues associated with wind and solar energy. We had the opportunity to travel to Aruba to meet with many of the key players in the Energy and Government sectors and wrote a report for the Aruban Government on our work. An article from the Carbon War Room discusses Aruba’s progress towards renewable energy and sustainability.